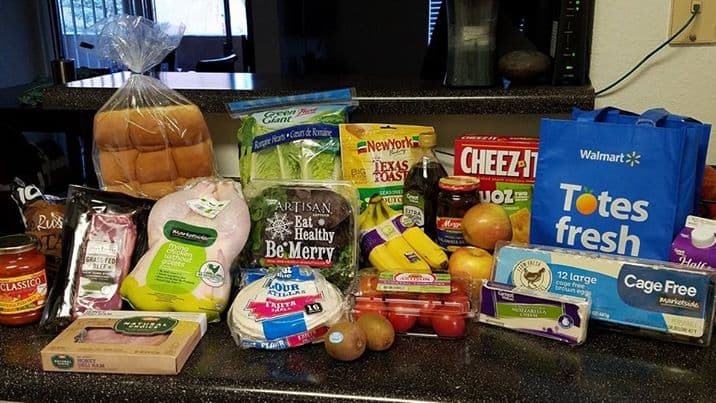 Disclosure: I tested out Walmart’s Online Grocery service mentioned in this post, and received grocery shopping funds from Walmart in order to do so. In an effort to save money and eat healthier, I have been meal prepping lately. On Saturdays, I put together my menu for the week and order my groceries online at Walmart. On Sunday, I drive to Walmart, pickup my groceries, and prepare the meals for the week. Then I have healthy, homemade meals ready for the entire week. I love it! In case you haven’t heard of Walmart’s Grocery Pickup program, let me fill you in. Browse groceries, add them to your online cart, and checkout online. You select a specific 1-hour time to pickup your groceries. Drive to your assigned Walmart. Park in a designated spot, call a number, and a few minutes later, someone comes out and loads your car with your groceries. I would also like to mention that this service is completely free. Yep, absolutely free. As many times as you want to use it. I have been using Walmart’s Grocery Pickup program for several months now. I think my favorite part is that I don’t even have to get my children out of their car seats to go grocery shopping anymore! It saves so much time, energy and money… it’s an invaluable service for a busy mom, like me. The picture above is from last week, when I used Walmart’s grocery pickup. I was able to purchase all of this for $60, and that fed my family of 3 for the week. The produce they selected was fresh and high-quality. There were no items nearing their expiration date (which was a fear of mine), and they got my order 100% correct. They also offer a 100% money-back freshness guarantee, so if anything is ever wrong, they’ll fix it! If you haven’t already, I recommend you check them out. It’s a fantastic service! One of the lunches I made for the week is an individual spinach quiche. It is completely homemade and easy to make. It combines fresh spinach leaves with cage free eggs and an appreciable amount of cheese, baked in a homemade crust. I decided to make these individual spinach quiche because they are easy to pack in a lunch for work, and conveniently portioned. 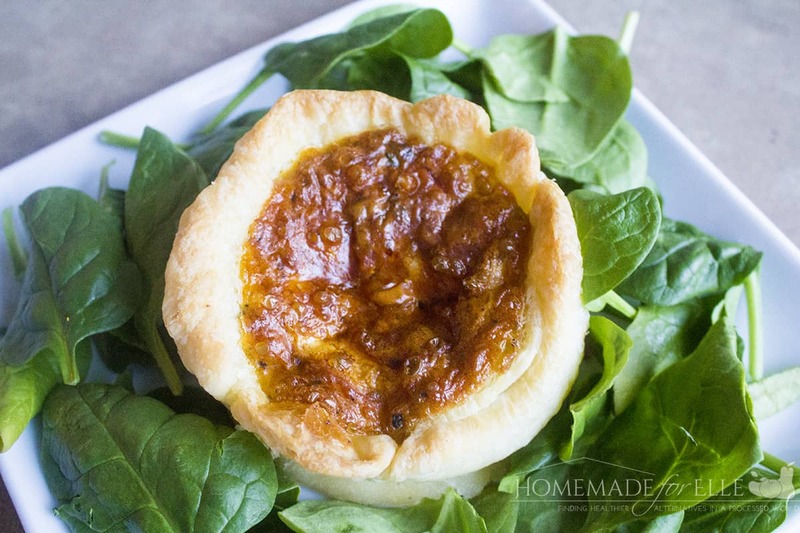 The buttery flavor and texture of the crust, paired with the savory, cheesy quiche filling, and colorful spinach leaves will make this a favorite in your home! Combine flour and salt in a food processor. Add in butter and use the pulse to break up the butter into pea-size pieces. Add in 1 tablespoon of cold water at a time, blending after each addition until the dough is coming together, and moist. Place dough onto a floured surface and shape it into a ball. Cover with plastic wrap and place in the refrigerator for 1 hour. Take 6 ramekins, or one pie plate, and grease with butter. Preheat oven to 375 degrees. Whisk eggs, heavy cream, salt and pepper in a bowl until very smooth. Take dough from refrigerator and lay out on a floured surface. Use a rolling pin or sturdy cup to roll out the dough. Cut dough into 6 ramekin-sized circles, or one large circle, if using a pie plate. Place dough in ramekins or pie plates. Layer on a row of spinach leaves on top of the dough, sprinkle with 1/6th of the cheese, and fill 3/4 of the way with the egg mixture. Repeat for all ramekins. Bake in preheated oven for 35 - 45 minutes, when you can insert a knife or toothpick, and it comes out clean. I hope you enjoy this recipe for individual spinach quiche! If you try out Walmart’s Grocery Pickup service, come back and leave a comment on your experience! Mmm, i’m a huge fan of spinach quiche. Making them individually sized makes them even better. I have got to try the Walmart Grocery Pickup program. I don’t know why I haven’t yet.